The companies are using their recently launched satellites to target underserved rural markets of the United States with weak Internet connections. “We can position ourselves as an alternative to people who have Internet, but it's not good Internet,” said Dan Turak, vice president of sales and distribution at ViaSat Communications. While the competitors sit on opposite coasts – ViaSat (Nasdaq: VSAT) is based in Carlsbad and Hughes is in Germantown, Md. – their sales executives had a side-by-side cooperative discussion Monday morning at International CES at the Las Vegas Convention Center. The cavernous convention center was a construction zone on Monday amid last-minute drilling, sanding and sawing to perfect exhibits for the flood of attendees on Tuesday. 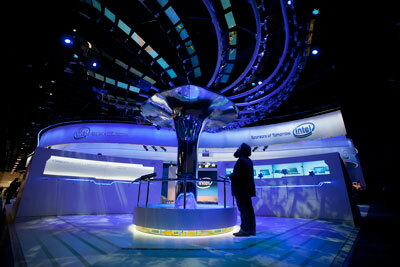 Among notable booths taking shape was a growing metal tree with laptops for leaves that acted as the centerpiece of Intel Corp.'s (Nasdaq: INTC) exhibit. The gadget fest – dubbed the largest trade show in the Americas – officially kicks off Tuesday, but several pre-show panels focused on broadband took place Monday. The panel, titled “Satellite Broadband: Positioned for Dramatic Growth,” was moderated by Joseph Widoff of the Satellite Broadcasting and Communications Association. “I can't imagine there being a consumer on dial-up in this world today,” said Allen McCabe, director of sales for Hughes Network Systems. The market of potential customers with dial-up or “terrible” DSL service is “huge,” he said. Dish Network Corp.'s (Nasdaq: DISH) new satellite broadband service called dishNET will go after rural customers with little or no Internet access, and both ViaSat and Hughes are looking to get a piece of the pie. Competition is good for the industry, McCabe explained. When he bought a DirectTV system in 1995, it cost $699, and he had to install it himself. But with the dawn of more satellite broadband companies, those price points have changed dramatically. “You can get a system for zero down and with free installation. So we are right there with video providers in terms of aggressive pricing and service packages,” McCabe said. Last March, ViaSat launched Exede, its new high-speed satellite Internet, which has helped attract a slew of new residential customers. ViaSat customers can expect to get new services, including voice, in the first quarter of 2013. ViaSat is also focusing efforts on preparing for enterprise. “We will be launching a robust enterprise program here soon that will enable us to go after the business marketplace,” Turak said. That means targeting businesses that don't have good Internet service. “We can be their Internet provider,” he said. Another way to sign on new customers is going after businesses with suitable Internet service that look to ViaSat for redundancy. “Business continuity. That is a big opportunity,” Turak said. Hughes, which has been around since the early 1970s, has a tenured background in business-to-business communications. Thousands of sites, ranging from convenience stores, gas stations to hotels, use Hughes technology. “When you swipe your card at the gas pump, most likely there is a Hughes system on top of the building, processing credit card information,” McCabe said. Turak pointed out that his company is expanding in various verticals. ViaSat has a hand in disaster recovery, for example. It's working with the Red Cross to keep Internet working amid crises such as last summer's scorching fires in Colorado Springs and the wrath of Superstorm Sandy along the East Coast. “That is why we have that relationship with Red Cross, because Sandy wiped out all the Internet. Satellite Internet can come in and not get wiped out," Turak said. This year, ViaSat is delivering Internet in the air via JetBlue Airways (Nasdaq: JBLU) and United Airlines. “You can get in an airplane and fly across the country and enjoy high-speed Internet,” Turak said. McCabe also plugged the Hughes-enabled, in-flight Internet service he used to surf the Web while flying to the conference from D.C. on Southwest Airlines (Nasdaq: LUV). While satellite broadband is gaining ground, efforts continue to squash misperceptions around the industry. One of those is building out infrastructure. “Our buildout is the satellite we put up in the sky,” Turak said. McCabe said his company has spent millions of dollars on consumer awareness over the last couple of years to communicate its role. “There is no build-out required, we have dealers and installers across the country. Someone can order a satellite broadband system today, and it can be installed tomorrow,” McCabe said. Many resources have been spent on targeting direct mail campaigns to consumers located in ZIP codes with no viable broadband solution. “We've poured a ton of money into local dealers and had local support of trade shows and home and garden shows to get local retailers in those marketplaces to talk to customers about a solution,” McCabe said. Six months ago Turak spoke to a group of local business and political leaders in Breckenridge, Colo., about their inability to get good Internet because of their geographical location. “They are desperate for good Internet,” he said. While ViaSat could market its services in downtown Chicago and Chicago suburbs, they'd rather target markets like Breckenridge. “Why would I want to do that when there are 20 to 30 million households that don't have good Internet? Why should I be chasing that when I have all this right here in front of me? That is what we are spending time on,” Turak said. It doesn't cost ViaSat any more to put a system in a Chicago suburb or a rural area of Colorado. Competition that exists in Chicago is much steeper, and they might offer a lower price, better fees or a bigger data allowance. “Allen and I have the countryside to ourself. That is the low-hanging fruit where we are focused on,” Turak said. Another misperception is people looking at satellite in the rearview mirror, in terms of products launched in years past. That's the marketing challenge he and McCabe are trying to solve. “It's our job to make sure people understand this is genuine high speed,” Turak said. ViaSat just completed a deal to start providing broadband to Australia and Saudi Arabia. Discussions are also under way to bring the service to South and Central America. “I think we both know we are going to have to build more satellites. People ask how many subs you can get on a satellite. I always say it depends,” McCabe said. His father, for instance, just uses Internet to send email – not things like YouTube or Facebook. “That's all he wants it for," McCabe said.